Our most popular Rechargeable model, the BHA-1222 is literally one of best Rechargeable amplifiers available. Smaller size, better speaker and a state of the art digital noise canceling chip make this amplifier a perfect option for those not wanting to deal with batteries. EXTRA LONG LIFE RECHARGEABLE VARTA BATTERY, CHARGE PROTECTION. SAFE. 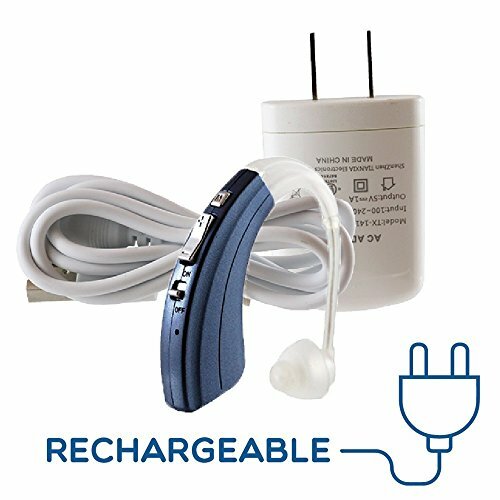 Save money with a rechargeable hearing aid made by the industry leader. Intentionally designed with an extra long battery charge, and charger protection to increase the battery life. 1 YEAR WARRANTY, FREE REPLACEMENTS, 90 DAY MONEY BACK GUARANTEE! If for any reason you're not completely satisfied with your hearing aid, we will issue a refund or replace as requested. SIMPLE TO USE & EASY TO WEAR Easy, one finger button controls. Easy to wear and lightweight. Adjustable tubes for both right and left ears. Comfortable fit. DOUBLE LAYER DOMES & DIGITAL CHIP TO DECREASE WHISTLING SOUNDS Our 5th generation digital chip is equipped with Smart Noise Cancellation that significantly reduces 'white noise' and ambient distortions, paired with our double layer domes, this hearing amplifier allows the user to hear what's most important. If you have any questions about this product by Britzgo, contact us by completing and submitting the form below. If you are looking for a specif part number, please include it with your message.